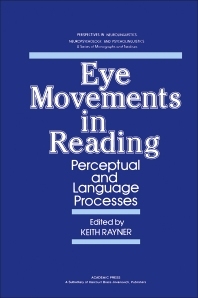 Eye Movements in Reading: Perceptual and Language Processes focuses on eye movement and cognitive processes as a way to study the reading process. This book also discusses the different aspects of reading. Organized into seven parts encompassing 26 chapters, this book begins with a discussion on the perceptual and psychophysical factors essential to eye movement during reading. This book then explains how some psychophysical factors, such as type size and masking, affect the reading performance. Other chapters consider the role of transient and sustained cells, as well as their possible effects on reading. This text also examines the size of the perceptual span in reading and the integration of information across eye movement. Finally, this book explains the eye movement abnormalities, general eye movement parameters, and the cognitive processes within the reading disabled group. This book is a valuable resource to optometrists, scientists, field researchers, and readers who are interested in the reading process. III. When during a Fixation is Visual Information Acquired? IV. is Information Extracted after the next Movement Has Been Programmed? V. is Information Extracted Within the Initial Portion of the Fixation? VI. is the Information That is Extracted on the Current Fixation Immediately Influencing Language Processing? VII. Do Display Changes during Fixations Cause Disruptions? III. Why Look at the Same Word Twice? II. What Influences a Fixation Duration? III. Characterizing Eye Movement Patterns: How Often Do Various Patterns Occur? 20 What Does the Mind Do While the Eyes are Gazing? 22 A Spatial-Relational Logic behind Visual Differentiation: Gibosonian Constructivism? II. are Two Letters the Same or Different? IV. Vaughan's Stimulus Delay Paradox: Can the Buffer System Explain it? 29 What Can Eye Movements Tell Us about Dyslexia?